The sky exploded in a spectacular display of celestial fireworks as Cyclone Ita lashed the Whangaparaoa Peninsula with one last swish of its venomous tail before heading down the country to disrupt the holiday plans of thousands of unfortunate travellers. Flashes of phosphorescent silver lightning illuminated Rangitoto's volcanic cone and the necklace of islands in the Hauraki Gulf as we reached our Easter destination, miraculously unscathed after a seven-hour drive from Gisborne through torrential rain and gale-force winds. Had we been an hour or so earlier, our route would have been completely blocked by a roof which Ita snatched off a house and plonked in the middle of Whangaparaoa Road. Arriving at an unfamiliar house late on a stormy night and praying the electronic access code was working despite widespread power outages added an extra element of drama to an already eventful day. We held our collective breaths as the massive ebony door slid noiselessly open and we tiptoed into a tiled marble entrance atrium so grand, our tired, deluded brains fantasised that Wills, Kate and baby George had just vacated the place. We wandered around the three-storey mansion exclaiming with delight as we discovered the cliff-top Airbnb holiday rental far exceeded the superlatives on the website - seven sumptuous bedrooms, five tiled marble bathrooms, a designer kitchen and scullery with commercial catering appliances, a dining area with bespoke furniture, a living space the size of an average house, a games room with pool table and walls lined with signed collectors' rugby, yachting and soccer jerseys... and a private theatre. A few steps beyond the doubled-glazed sliding glass wall overlooking the gulf was a stunning infinity pool flanked by matching pavilions with a gym on one side and an outdoor BBQ/kitchen/bar on the other. Gusts of wind were blowing the waterfall overflow back into the pool in a bizarre defiance of nature. 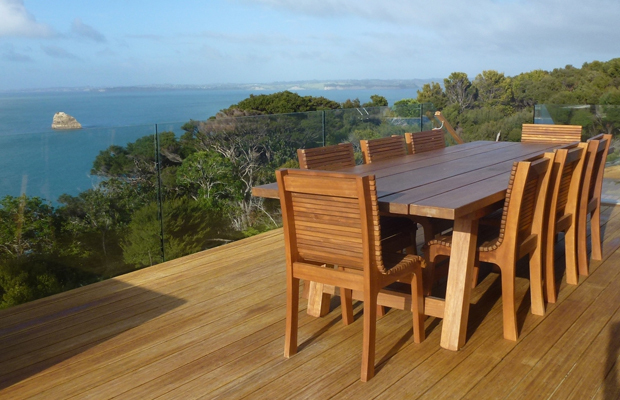 Tucked behind the gym was a large Jacuzzi looking out to Rangitoto and far beyond. Ita exhausted itself overnight and the fury of the storm was replaced by the soft diffuse light of dawn, transforming the landscape into a smudgy watercolour. Weather was virtually the only variable beyond our command in Mat's extraordinary, high-tech house where all functions were electrically controlled. Even the lights were sensor-activated and came on automatically as you entered a room. Whenever rain confined us to barracks, we made a beeline for the reclining leather armchairs and the latest movies in the purpose-built home theatre - the delightful French-subtitled Intouchables topped the list - or played pool. I defied the rain and chose to wallow in the steamy Jacuzzi watching the changing textures and colours of the sea and the sky. Auckland's Sky Tower was glinting in sunshine one minute and swallowed by misty showers the next. Between rain storms we explored large swathes of the countryside and were astounded at the beauty of the region and the variety of activities and sights within an hour's easy drive of our doorstep. The area is not only blessed with a myriad of islands but is spoilt with the number of exquisite beaches facing every direction, enabling us to find protection from the elements. A flotilla of little yachts dotted the windy bay off Big Manly Beach, while just over the hill pretty little Matakatia Bay was warm and sheltered. Shakespear Regional Park at the tip of the peninsula and named after the Shakespear family who bought the land in the 1880s from local Maori, is criss-crossed with excellent walking trails. 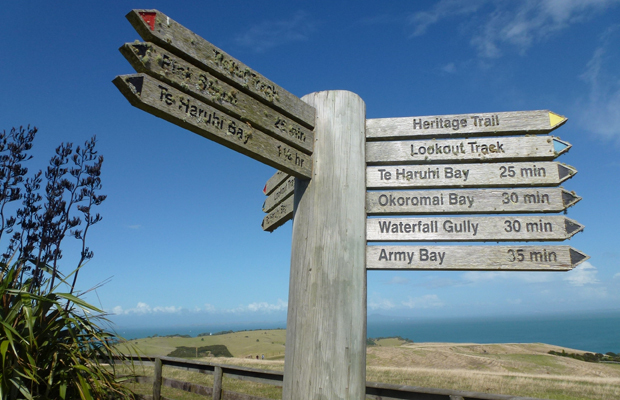 We hiked up to the lookout for 360-degree views of rolling green farmland, Auckland's CBD, white sand beaches, islands upon islands and the Coromandel Peninsula in the distance. The sun made a brief appearance by the time we reached Te Haruhi Bay on the south side of the park so we walked the length of the lovely sandy beach where children were playing in the shallows. We unwittingly joined half of Auckland when we leapt in the car on Saturday morning and headed for Matakana Village Farmers' Market. The weather had defied the forecast and the little town was swamped with families eager to escape outdoors. The stalls were sold out, tout de suite, but we still managed to sample some gourmet cheeses, dukkah, mustards, chutneys, breads, whitebait, salmon and a superb Hyperion Helios Chardonnay. Sadly we missed out on the mussel fritters. Keen to escape the market crowds, we tootled out to beautiful Omaha Beach, a seven-kilometre isthmus with a collection of traditional Kiwi baches at one end, opulent mansions at the other, and a golf course on the estuary side. The cyclone had provided an unexpected windfall the day we visited, dumping thousands of scallops into shallow water much to the delight of shellfish lovers. Families were swimming and surfing in the surprisingly-warm sea, revelling in the sun, walking along the beach or gathering scallops. The famous Leigh Sawmill Cafe was our late lunch spot with delicious garlic and herb pizza bread and hummus accompanied by a hugely-flavoursome Ransom Wines Clos de Valerie Pinot Gris and a "grunty" 12 Gauge lager hand-crafted at the cafe's own brewery. Cold Chisel's Don Walker and The Bads band were tuning up for a show that evening so we got a fabulous sneak preview of their gig. The day ended at Goat Island, New Zealand's first marine reserve, where you can swim and snorkel with the fish or stay dry and view the stunning marine life from a glass-bottom boat. The culinary highlight of the long weekend was the Omaha Beach scallops cooked in butter, garlic and a Gisborne chardonnay (sorry Matakana!) that evening in our fabulous kitchen. 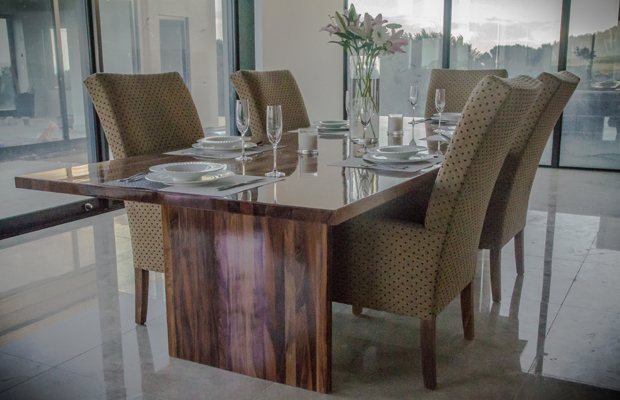 The three-metre heart rimu kitchen island and matching bespoke dining table were a focal point at meal times with everyone congregating to cook, chatter, eat and critique the local wines. Bliss for a family who are seldom together these days. A major plus about renting a fully-equipped house as opposed to a hotel or motel is that you don't have to bring absolutely everything with you, food-wise. Mat insisted we use items in his pantry, fridge and garden. At Easter when the shops were shut for two days, it was a God-send to have items like sauces, spices, flour, fresh herbs and vegetables on-hand. Ascension Vineyard seemed an appropriate winery to visit on Easter Sunday, and even more apt when among the tastings, we found ourselves sipping a divine 12 Apostles Malbec Merlot. A visit to Tiritiri Matangi Island is an absolute must, especially for bird lovers. The little island, just 25 minutes' ferry ride from Gulf Harbour, is a treasure. One of the world's most successful volunteer conservation projects, 300,000 native trees have been replanted on the island and 12 endangered birds and three reptile species re-introduced. If you stay overnight, you might see nocturnal wildlife such as the little blue penguin (the world's smallest penguin), the little spotted kiwi, and the tuatara. You can also take a guided tour and learn more about the bird life and the fascinating history of the island. At the end of the long weekend, when it came time to vote for a scenic highlight, Tawharanui Regional Park, took the prize. 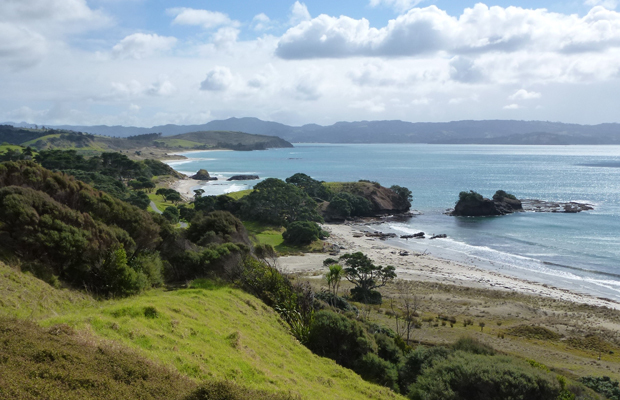 Like Shakespear Park it is a predator-free open wildlife sanctuary at the end of a peninsula, but it is much more remote and wild with rocky headlands, white sand beaches, and regenerating native forest and wetlands. We chose one of eight excellent walkways, the north coast track, to the spectacular rocky Tokatu Point. Our Sydney-based daughter was excited to see magnificent pohutukawa trees on the coastal cliffs and hear bellbirds and tui on the ecology walkway... sights and sounds of home. It was warm enough for a picnic lunch in a sunny sheltered spot at Anchor Bay where a surfing school was taking advantage of perfect, beginner-sized waves. There was even time for a round of golf at the world-class Gulf Harbour Country Club, one of two courses within a few minutes' drive of our house. Whangaparaoa means "bay of whales" but could well mean bay of sails. With the Gulf Harbour marina just below us, there was a steady stream of yachts and launches heading in and out of the sheltered cove whenever the fickle weather gods behaved. Before we left the house I took a long last look at Rangitoto framed in that massive entrance way. It's not easy as a Central Otago-phile to give credit to scenery other than mountains and lakes but I found myself paying silent tribute to the forces that shaped this extraordinary land, island and seascape. At Mat's house, there was no escaping the mesmerising view. I cannot imagine why anyone would rent a hotel suite or motel or apartment when for a similar price - shared among a number of couples - you can enjoy your own private luxury resort. I doubt I will ever set foot in a hotel again. Justine's stay was assisted by Mat Hughes and Airbnb.